Sparse files are common in Linux/Unix and are also supported by Windows (e.g. NTFS) and macOSes (e.g. HFS+). Sparse files uses storage efficiently when the files have a lot of holes (contiguous ranges of bytes having the value of zero) by storing only metadata for the holes instead of using real disk blocks. They are especially in case like allocating VM images. 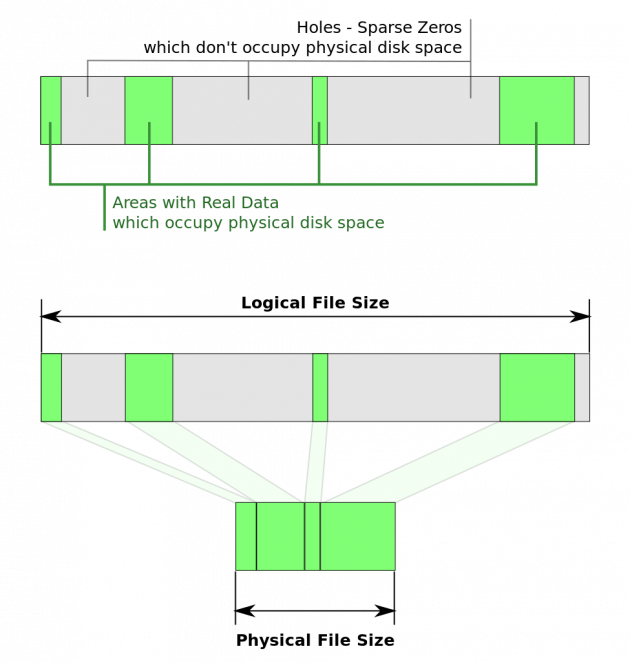 The following image illustrate the structure of a sparse file (image by: User:Sven on Wikimedia). In this post, we will discuss some common tools and libraries for handling sparse files in Linux environments. Linux has a bunch set of tools that can make or handle sparse files. You may use truncate or the general dd to create sparse (almost empty) files. truncate shrinks or extends the size of a file to the specified size. So if the file already exists, truncate only appends holes to its end. If the files does not exist yet, truncate will create the file by default. For example, the following command will create a 20GB empty sparse file or extend/shrink it to 20GB if it already exists. The common dd tools can make sparse files too by dding from /dev/zero. For example, to create a 20GB size vmdisk0, dd can do as follows. To efficiently handle sparse files, the kernel and tools should support the SEEK_HOLE/SEEK_DATA functionalities. For details, please check SEEK_HOLE and SEEK_DATA: efficiently archive/copy large sparse files. If you are using a Linux system with kernel greater or equal to version 3.1, the kernel and tools in it will like already support sparse files. A set of tools that may be used: rsync, tar, cp and more. There are a set of C functions available for handling sparse files. Other programming libraries may be built above of them. Some of those that can be used are as follows. If what you want is to create an empty sparse file, lseek could be enough. Here is one example of C function using lseek(). The idea is to create a file, seek to the required size and close the file. There will be naturally a large hole in the file. Check more in lseek() manual. If the file previously was larger than this size, the extra data is lost. If the file previously was shorter, it is extended, and the extended part reads as null bytes (‘\0’). Check more in truncate() manual. Check more in fallocate() manual. Worth mentioning, also, is probably the fallocate(1) shell command, and especially its -d (–dig-holes) command-line flag. `fallocate -d $file` will analyze and “re-sparsify” $file, by deallocating any of its disk blocks which contain runs of zeroes. Useful if it’s been accidentally expanded to its full size by running it through a tool that didn’t preserve the file’s sparsenes.